OMR Home is presenting easy to download 60 questions OMR sheet. Just one click and you can have this fully designed OMR sheet for free. With Verificare OMR software as your partner you can completely rely on having authentic designed sheets that will accurately serve your purpose. Administrators running coaching centers can download this free OMR Sheet sample to prepare their candidates for mock test by simply taking a printout of it. 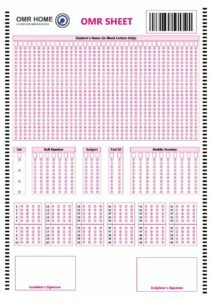 This sample OMR sheet consists of 6 rows, with 10 questions in each row. Every row has got 5 sets with 4 options, to answer from, named A,B,C,D. At the end of the page 2 boxes are assigned, for candidate’s signature and invigilator’s signature. SEE ALSO: An informative guide to the process of OMR Sheet Evaluation!